Fifteen years after Earth joins the Galactic Free Trade Association, the planet is flooded with alien technology. Somebody has to support all the new galactic tech, and Jack Buckston, president, CEO, and sole employee of Xenotech Support Corporation, does his best to keep his clients happy, find true love, and prevent interstellar war. Galactic technology has cured cancer, solved the energy crisis, and eliminated global warming - but what do the aliens want from us? They can't get enough congressional subcommittee broadcasts. They consider them reality comedies! 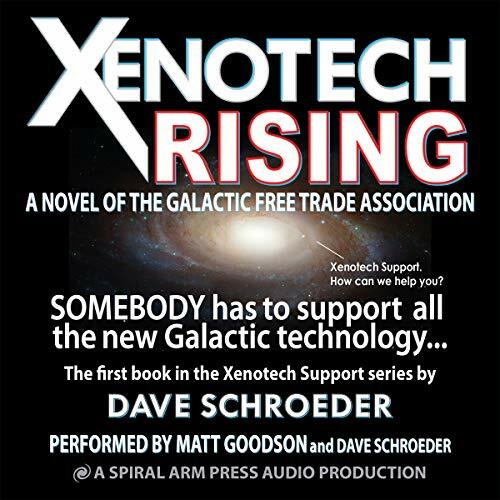 Xenotech Rising is a light-hearted romp and the first book in the Xenotech Support/Galactic Free Trade Association series. loved the light hearted and easy to understand dialogue. the characters are easy to enjoy and and relate to. So much of this book makes actual sense. Wow it is a fantastic science fiction it is also a great quick read. will read it again and likely share with my own children. looking forward to the rest of the series. Have it on Kindle, and had to get the Audible too. Those who are steeped in Geek Culture get a bonus as there are tons of references. The book is set in near future Atlanta, GA, and I expect natives of that area will recognize the local restaurants and institutions. The narrator is great, and you can almost hear him smiling in some passages. Great story in a familar setting. A refreshing and fun story set in a futuristic Atlanta. Narrator does an amazing job bringing character's personalities out.